You might think ocean cruising consists solely of lazing about in a deckchair, a fruit cocktail in hand, doing little more than watch the water slosh about the ship’s swimming pool. But I have to report that cruising the Inside Passage, between Canada and Alaska, is non-stop action. Whatever your choice of cabin, be it port or starboard, upper or lower deck, there’s an unwritten law of the sea which, simply put, says the most enthralling sights of the cruise inevitably occur when you are least ready for them. It means you spend little time actually relaxing in your cabin and a great deal of time executing the cabin-to-deck dash, only to catch a departing glimpse of what your more prescient fellow passengers will no doubt describe as the most singularly thrilling experience of their lives. So it was with whales while cruising aboard the Crown Princess, one of a fleet of six graceful Princess Cruise Line ships that ply the Inside Passage between Vancouver and Seward during the warmer Alaskan months. By September, on the last cruise of the season, it was autumn and the weather overcast. The sun was on holiday down south and daytime temperatures of around 9°C were considerably lowered by wind chill. The ship's pool was therefore deserted and deckchairs were strapped into neat stacks. Passengers working off a surfeit of breakfast made regular brisk circuits around the decks. We had on board an effusively enthusiastic cruise naturalist called Brent. One of his many sizzling natural passions was the humpback whale. I was dreamily contemplating passing glaciers from the comfort of my cabin when the alarm sounded. "Whales, whales, three o'clock", came the urgent bellow over the ship's intercom. "Humpbacks, whooo boy!" yelled Brent from the bridge. The slamming of cabin doors and the patter of feet told me I was not the only one caught offside. Grabbing my camera, I charged headlong for the uppermost deck as Brent's electric commentary urged me on to greater feats of nimbleness and speed than I'd imagined possible. "Look at them go ... oh, look at that, a beautiful, double fluke re-entry!" he gabbled, like a demented Olympic diving judge. "Now a breach, wheee boy! And another breach, oh my gawd! Absolutely fantastic!" I burst on deck, heaving and panting. Passengers were pressed four-deep along the starboard rail, seeming to lend the 70,000-ton liner a slight list. Brent's voice barked again. "More humpies, one o'clock!" I was leaping up and down like a Samburu warrior trying to see over the collected heads. "Fabulous. That's made my trip!" exclaimed one extremely short, bespectacled man pressed up fast against the rail. "Nine o'clock, nine o'clock! A breach, a breach!" Brent was now beside himself. I was beside myself! That was my side of the ship! Had I stayed put I'd have had a balcony seat to myself. We rushed to port, where I rucked and mauled my way to the rail. And thar she blew! A glistening leviathan hurled itself ecstatically from the frigid water off Point Adolphus, fins akimbo, its enormous barnacled body on display for a fraction of a second before crashing back into the green seas in a burst of spray. Inside Passage cruising can be as exhilarating as it is energetic. During our seven day cruise I worked out regularly, rushing about the ship, propelled by an urgent voice describing significant but fleeting moments in this vast, preternatural landscape of mountains, snow and ice. Considering the avalanche of food that flowed day and night from the ship's kitchens this regular exercise was essential. Daily consumption aboard ship included 1400 kg of meat, 380 kg of fish, 730kg of vegetables, 150kg of pasta, 1100 litres of coffee and more than 3000 delectable little pastries. This resulted in 39,000 dirty plates a day and nearly 13,000 dirty glasses. The 27 crew members on the continuous wash-up squad remained out of sight below decks, if not entirely out of mind. In College Fjord we saw no less than seven glaciers, including Vassar, Harvard and Yale. The Captain carefully put the ship within 400 metres of one gigantic ice flow. We clung to the rails, peering from our wondrous vantage point into the deep, hypnotic blue of highly compressed ice, hoping to see the calving of an iceberg. The rule on glacier calving is simple: once you hear the crack, the ice has already fallen! So never avert your eyes! I heard several sharp retorts but I saw little, perhaps caught offside again. But I did witness spectacular calving off Margerie Glacier as the ship probed deep into Tarr Inlet off Glacier Bay. Alaska cruising is not for the faint-hearted. 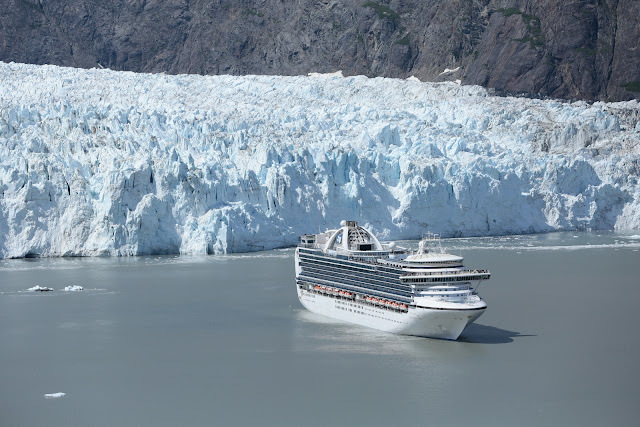 The most popular shore excursion of our trip was glacier-hopping by helicopter high above Juneau, a dramatic aerial plunge into a primeval realm of forbidding, craggy peaks and ice-bound valleys. More sedentary shore options included fishing trips, nature walks and cultural tours. Another option was souvenir hari-kiri. 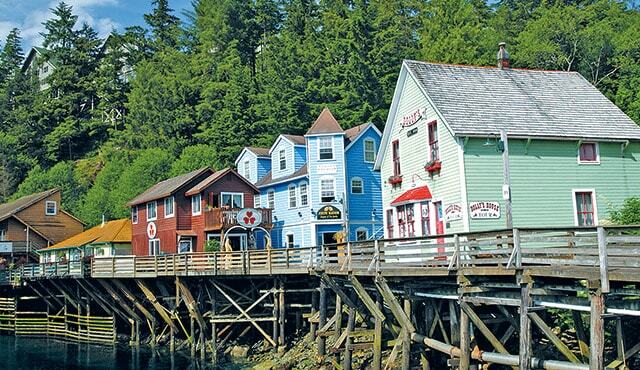 The old salmon-fishing town of Ketchikan, the neat Alaskan capital of Juneau and frontier-flavoured Skagway each boasted unique attractions but shared a common blight, the excess of souvenir shops weighed down with a repetitive range of memorabilia. This, however, didn’t deter most of the passengers who seemed delighted to discover shopping nirvana at latitude 58°N. Alaska has an exceptional "official state fossil", the woolly mammoth. Its frozen bones, found in the glacial ice fields, swiftly make their way through the hands of carvers and scrimshaw artists into outlets along the cruise ship corridor. They compete for attention with carved walrus tusks, polished polar bear teeth, crude jade carvings, Alaskan opal pendants and necklaces of "black diamond" haematite. Other souvenirs include ulu knives, crystal and porcelain figurines, fluffy animal toys, tins of smoked salmon and an endless unfolding of slogan-rich T-shirts. The most intriguing indigenous artifact was undoubtedly those moose droppings, dipped in varnish and fashioned into earrings. Or how about moose poo swizzle sticks? Escape from all this was found in the Naa Kahidi Theatre in Juneau where I watched enactments of the myths and stories of the Tlingit, Haida and Tshimshian people. The town’s lively Red Dog Saloon also provided refuge from souvenir overload, as did Skagway's Red Onion Saloon where cruise ship musicians joined local players in an afternoon jazz session. Riding the rails above Skagway towards White Pass I had a Gordon Gecko moment, almost believing that greed might be good. The lust for gold certainly propelled people to insane heights of determination. One example is the staggering feat of engineering and hard labour that created the White Pass & Yukon Railway. The line was made by chiselling, hacking and tunnelling through solid rock. It crosses narrow canyons on spidery trestle bridges and overcomes formidable natural barriers on its steep haul up to Whitehorse and the old Yukon goldfields beyond. The ride to Whitehorse and back to Skagway was a four-hour excursion of exceptional scenic beauty with the chance of spotting some wildlife, but only for quick sighted. A bear glimpsed lumbering up one side of the track disappeared within seconds into the surrounding bush. More wildlife may be seen from the Midnight Sun Express which runs between Fairbanks and Anchorage via Denali National Park, hauling luxury railcars with panoramic views up top and stylish restaurant below. The trip can be a land tour add-on to a cruise. Fairbanks was at its most beautiful, displaying an autumnal royal flush of luminous golden birch forests. The rich palette of summer's final shredding, a riot of amber and carmine, ochre and sienna, was reflected in the glassy smooth surface of the Chena River. A light powdering of snow called terminal dust, heralding the end of autumn, had settled on the mountains. The M/V Discovery paddlesteamer churns along the Chena on a carefully prepared excursion that provides a whiff of life in the frozen north. At a model native Athabascan village two Eskimo college students, one Yup'ik, the other Inupiak, gave a delightfully frank, funny and informative commentary on the traditional lifestyle of their grandparents. I ended my trip at the Anchorage Museum of History and Art where I was fortunate to see an exhibition of ancient Indian and Eskimo masks. It was a fascinating visual insight into local history and culture and a fitting finale to my Inside Passage adventure.